In this file photo, U.S. President Donald Trump speaks at The White House during a lunch with the United Nations Security Council, Jan. 29, 2018. About 11 million people are covered by HealthCare.gov and state markets. Administration officials said Tuesday that states and the federal government would share regulatory oversight of the plans. The Trump administration's new health insurance option offers lower premiums for small businesses and self-employed people, but the policies are likely to cover fewer benefits. 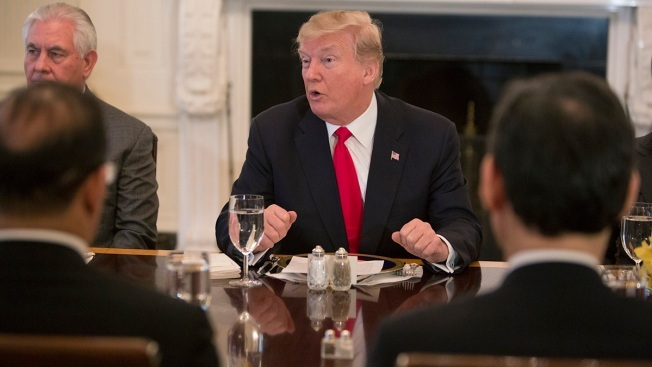 President Donald Trump and Labor Secretary Alex Acosta rolled out their final blueprint for "association health plans" on Tuesday, with Trump promising a small-business group that "you're going to save massive amounts of money and have much better health care." Democrats decried it as "junk insurance," and some patient groups warned it could undermine coverage for people in poor health. Republicans and some small-business groups said the administration is providing needed flexibility in the face of rising premiums. The new plans created under the administration's regulation incorporate the same protections for employees with pre-existing conditions that large-company plans now have, Acosta said. Trump has long asserted that promoting the sale of health insurance across state lines can bring down premiums without sacrificing quality. But many experts aren't convinced because medical costs vary greatly according to geography. Currently, plans for small businesses are required to cover the ACA's 10 categories of "essential" benefits, from prescription drugs to maternity and mental health. Under the new approach, small employers could get coverage that comes with fewer required benefits, said Gary Claxton of the nonpartisan Kaiser Family Foundation. Acosta cited CBO estimates that predict a modest impact: about 4 million people covered by the plans within five years but only some 400,000 who would have been uninsured. Compare that to the total number of about 160 million covered by job-based insurance. "They are providing insurance options that have fewer benefits and fewer requirements than ACA-compliant plans," Claxton said. "That will have a tendency to pull healthier people away because they are more attracted to plans with fewer benefits." Another major initiative is expected later this summer when the administration eases rules for short-term health plans lasting less than a full year that could be purchased by individuals. Those plans wouldn't have to cover people with pre-existing conditions but would offer healthy people much lower premiums. Critics say the administration's approach will draw healthy people away from the health law's insurance markets, raising the cost of coverage, which is subsidized by taxpayers. About 11 million people are covered by HealthCare.gov and state markets, but the administration's priority is to try to lower premiums for an additional 7 million or so who buy their coverage directly and don't get any help from the government. A small business group called Job Creators Network welcomed the Trump administration's move. President Alfredo Ortiz said it "will create more options, more competition, and lower costs for Main Street small businesses."